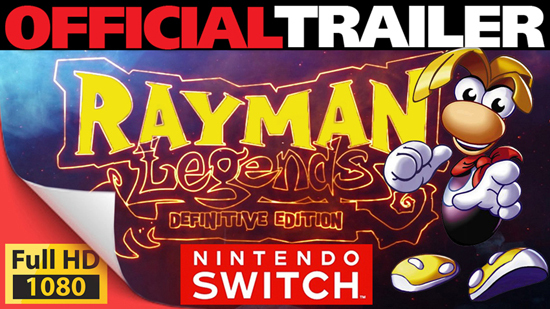 Rayman, previously named platformer of the year and winner of multiple artistic and musical achievements, comes to the Nintendo Switch for the first time with Rayman Legends Definitive Edition. Rayman Legends Definitive Edition allows up to four players to play in co-op, and offers an exclusive wireless local multiplayer experience in Kung Foot mode. With the Nintendo Switch device undocked, players can use the touch screen to take out enemies, manipulate platforms, cut ropes and much more, anywhere, anytime, in both solo and multiplayer. Set in the enchanted world of Rayman, the game follows Rayman and his colourful band of friends as they discover a mysterious tent filled with a series of captivating paintings. The gang must run, jump, and fight their way through each world to save the day and discover the secrets of every legendary painting.